ANDROID FLYBYS: Our field-tested satellite tracker is now available for Android phones. Features: Global predictions and flyby alarms! Learn more. SOUTH PACIFIC ECLIPSE: Yearning to visit the South Pacific? Now is the time to set sail. On July 11th, the Moon will pass directly in front off the sun, producing a total solar eclipse. The path of totality stretches across the south Pacific Ocean, making landfall in only a few places: Mangaia in the Cook Islands, Easter Island, and the southern tip of South America. Get the details from NASA. NASA's Solar Dynamics Observatory recorded the flare during the early hours of July 8th. It heralds the approach of a sunspot--possibly a big one--that has been erupting on the far side of the sun for days. A notable blast on July 5th hurled a bright CME over the limb. 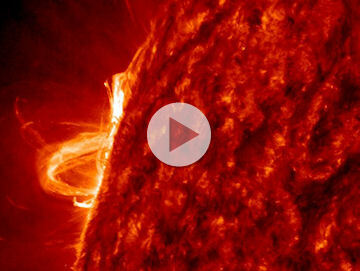 Soon the active region will turn to face Earth and its eruptions could become geo-effective. Stay tuned for space weather. WHITE RAINBOW, GOOD OMEN: Waking up early on a foggy morning can have surprising rewards. Consider the tale of Artur T. Grodz of Elblag, Poland: "July 4th was election day in Poland, and I woke up early to get to my polling station. I was pedalling my bike along the Vistula river when I witnessed an extraordinary white rainbow." 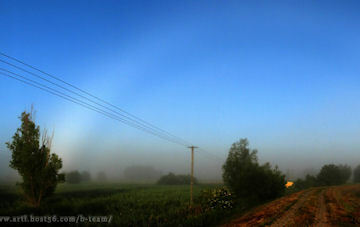 Actually, it's a fogbow, caused by sunlight reflected from tiny droplets of fog hanging by the river's edge. They're often called "white rainbows" because of their rainbow-shape and pale colors, but rain is not involved. Readers, to see your own white rainbow, follow these instructions: Wake up early, find some morning fog, face away from the low-hanging sun. Apparently, it's a lucky way to begin the day. On July 8, 2010 there were 1138 potentially hazardous asteroids.